Fin and Caroline are just back from a great weekend teaching and performing in Belfast. The interest for Scottish step-dancing is growing in Ireland – just watch for those crossover steps. Thankyou to Bernie and all at Belfasttrad.com for making us so welcome. Derry was completely buzzing with events as part of the European City of Culture and the Fleadh seemed everywhere throughout the city. Fin, Sandra and Caroline found themselves hosting a Ceilidh workshop and performance with over 200 people, and people coming back for more the next day. Always a great time in Derry. Our second time at the hugely successful and very busy Merchant City Festival. Workshops and performances in Merchant City Square with Sandra, Caroline and piper Angus Nicolson from Skye. Almost becoming a regular feature on the Dannsa calendar are these great visits to the Irish language arts and cultural centre in Derry. Sharing workshops and performances with those in Derry excited to pick up some Scottish steps. We joined forces to create a new dance piece with the Lothian Gaelic Choir performing alongside Cruinn at Greyfriars Kirk. A delightful collaboration with dancer Michael Sherrin was a very welcome addition to the project. The Dannsa team - Fin, Sandra, Caroline and our returning swallow Mac Morin from Cape Breton had a lovely time in workshops and sharing dances with everyone in Banchory, South Queensferry, Broadford in Skye and Marybank. Had a great tour with 7 of us performing (ourselves and Catriona Watt, Frank McConnell, Mac Morin and Matheu Watson) in April throughout the north of Scotland getting as far west as Bernera, west coast of Lewis and as far east as Laurencekirk. Then in September we toured the Central Belt of Scotland, most west was Paisley and most east was St.Andrews. We all hugely enjoyed both tours and it was great to be so supported and appreciated by our audiences - thankyou to everyone who came along and for all the lovely comments and reviews. We enjoyed the show so much we intend to get it back on the road again sometime in the future. Mac Morin, who first worked with Dannsa when Beolach came to Scotland (see below), came back to do a wee project. We spent the first week, working on two new dances that were preformed after the dance workshops. We went to Marybank, Aberdeen, Skye and South Queensferry. Thanks very much to all the folk who came, and to the groups who helped organise things. Dannsa had been working on a new dance piece with Gaelic singer Julie Fowlis. Part of the process was for Sandra and Caroline to learn the songs that they were dancing to and Julie to learn some steps. This concept was extended to the workshops. After a great morning dancing, everyone took part in a singing workshop. Learning some great Puirt A Beul. In the afternoon as well as Fin playing for one of the classes Julie sang for the other one, with each class showing what they had managed to learn during the afternoon. Dannsa and Julie then showed the new piece, although not finished it was very special to see the begins of a new dance, that they hope you will see sometime in the future. Dannsa went back to some Gaelic Primary schools to give workshops. It was lovely to catch up with some of the children we had taught other years and see how much they had remembered from our previous visits and also start some new nursery kids off on some steps. They were also also joined by piper Angus Mackenzie for the days in Skye. 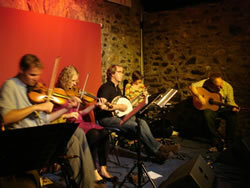 Dannsa went on tour with Cape Breton group Beolach. (www.beolach.com) after our busy Starthspe Away. We went to the north (Inverness), west (Skye), south (Edinburgh) and lastly the middle (Birnam) of Scotland. With some of the best musicians and dancers from Cape Breton and Scotland on board this turned out to be a great show. As well as Dannsa and Beolach performing there own sets, they had spent the week before working on two new pieces that involved everyone, either playing, dancing, singing. Some people even had to do more than one! These sets meant there was a real meeting between the two groups and although from 1000 of miles a part both cultures worked really well together and it was an impressive spectacle. Both groups hope it can happen again somewhere. ‘Sgoinneil’........fantastic, was the overriding feeling on this years Strathspè Away Festival in Kingussie as greater numbers flocked from throughout the country to attend. From the first opening bars of the Bella MacNab Ceilidh Band on Friday night through to the final ‘Ho-ro gheallaidh’ get-together, the energy and wow connected all those who danced, sang and played at the festival; professionals and novices alike; those who attended only one class and those who were there for the whole weekend. The sun shone the whole weekend showing Badenoch at its best. Dannsa, who host the festival, made it a homecoming indeed, extending the welcome as far as Cape Breton, Spain and Ireland. The performances at lunchtime and in the evenings were of the highest standard; Beolach from Cape Breton, Alba Flamenca and Dannsa. Classes were attended by over 200 people. Everyone is looking forward to revisiting Kingussie in 2010 when the festival takes place on 12-14 November. The new dannsa Ceilidh Band with Caroline calling the dances, played in Achiltibuie, South Queensferry, Newtonmore and Dalguise this spring followed by a three night tour this summer. In the summer they started with a full house at the Gaelic college in Skye. They then headed north to Poolewe, where they warmed-up the atmosphere with an afternoon dance workshop, in preparation for the ceilidh. The night had the feel of a traditional ceilidh, with a lot of 'ceilidhers' adding to the dannsa repetoire with performances of their own in between the dances. Next day was a drive over one the most amazing road in the country to Applecross, where the band finished the week off with another great night. “great ceilidh band and they played some cracking tunes, plus good calling....the inclusion of those pipes really made the band'” participant South Queensferry. The Ceilidh Band will have more dates in 2010 - watch this space! Caroline and Fin went to South Uist to learn from one of the great step dancers from Cape Breton. Harvey Beaton. They had a great week learning some new steps and trying to make some the old ones better! Caroline also took singing classes with some of the the best Gaelic singers, Rona Lightfoot, Catriona Garbutt and Gillbride MacMillan and Fin also learned some tunes from John MacLean, a great Cape Breton traditional piper. They both had a great week, taking in all the evening ceilidhs and concerts. Sandra joined them half way through the week, for a photo shoot with John Sikorski. They had a great few hours on one of South Uists many beautiful beaches. delivering traditional dance and music classes again this year. Dannsa visited the primary schools in Dingwall, Portree, Tollcross and Newtonmore teaching all classes through the medium of Gaelic ensuring that Gaelic medium pupils feel included in the “Homecoming” project this year(2009). Sandra Robertson and Caroline Reagh taught step dance with Fin Moore on pipes accompanying the workshops. At Tollcross Primary School, Dannsa were joined by Gillebride MacIllemhaoil and by Liz MacLean at Portree Primary School who both sang in Gaelic for the workshops.